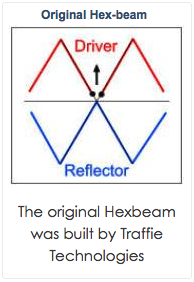 The original HEXBEAM was developed by Mike Traffic, N1HXA, in the early nineties. It is true that an “M” over “W” configured yagi antenna that resembled a butterfly was earlier tried successfully. But the advanced electrical design, the characteristic nesting concept and central terminal post that enable the multi band functionality along with the basic hardware design were all developed by Mike Traffie. Mike says his design was inspired by the snowflake and even cites the Holy Scripture. He spent much time in testing and analysis of the antenna to allow practical, multi band operation. Mike invented many of the unique fixtures and components and began offering the new beam commercially, obtaining a legal trademark of the term “HEXBEAM.” That is the reason most makers of the hexagonal beam in the U.S. avoid the improper use of that term. The HEXBEAM was reviewed favorably in both CQ and QST magazines and soon earned a reputation for being a pileup buster among its owners. For a number of years it was the only commercially available hexagonal beam. Eventually, home brewers began building the “hex beam” and for years, web sites maintained by W1GQL and DL7IO were the intellectual source for those who wanted a classic “hex beam” but preferred to build it themselves. The Traffie beam is no longer offered commercially but there are a lot of HEXBEAM aficionados and the beam was quite well made so it will be heard on the air for some time. Many homebrew versions of the original Hexbeam are in service today. This original design is a good antenna and owners of the HEXBEAM are quite vocal about its performance as were builders of the homebrew version. But things have progressed a little and thanks to the exhaustive work of Steve Hunt, G3TXQ, in 2007 a slightly different configuration of the hexagonal beam was discovered. Viewed from above the wires for a single bander look like the sketch to the right. The new version is much easier to build and adjust than the original classic version. And it has a broader frequency response than the original version. The only disadvantage is that the new broadband version is 22 ft in diameter vs 19 ft for the original Hexbeam. 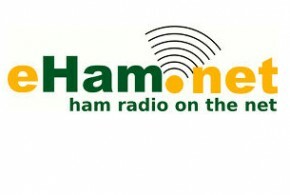 Hunt published his work in the December 2007 edition of Antennex – the on-line magazine for antenna experimenters. 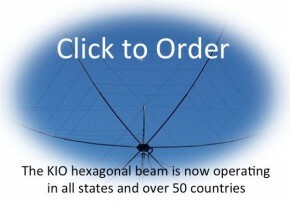 Later, K4KIO published an article on how to build a broadband hexagonal beam in the March 2009 edition of QST. Nearly all of the companies both here and abroad who are selling hexagonal beams are offering only the new broad band hexagonal beam and homebrewers are all building that version of the hexagonal beam instead of the original classic version. If you want to build a new broadband hexagonal beam go here for step by step instructions that include a list of parts with sources. 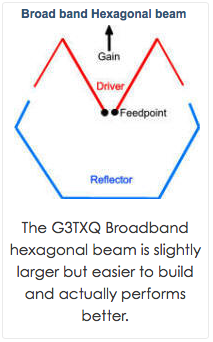 For a more full understanding of the technical parameters of the G3TXQ broad band hexagonal beam, visit the web site of Steve Hunt, the inventor of the broadband beam. If you feel you would rather not get into building your own G3TXQ broad band hexagonal beam, you can buy one on this web site. See the details here. Next What size mast for my Hex?